Common Foot Problems - Toms River, Forked River, And Whiting, NJ - Ocean County Foot & Ankle Surgical Associates, P.C. When it comes to medical treatment for common foot problems, take full advantage of the services and treatments offered at Ocean County Foot & Ankle Surgical Associates, P.C. We are a team of highly experienced Foot & Ankle Surgeons that believe patient satisfaction should always be the top priority. No matter what type of foot or ankle problems you are suffering from, we are here to provide you with the attention and care you deserve. This condition can lead to a discolored, loose, or thickened toenail. Fungi are more likely to develop in dark, moist, and warm areas, especially inside a shoe. This condition can develop for a variety of reasons. Our physicians can help deal with related pain, swelling, or infections. Corns and calluses are areas of thickened and hardened skin that develop on the underside of your feet or toes. 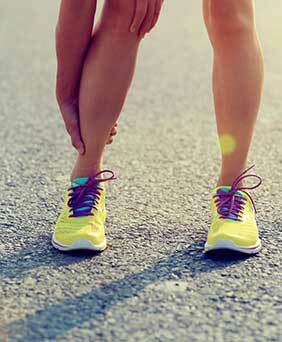 Our physicians can help treat inflammation and pain associated with heel conditions. This condition affects all types of people, even those who are not athletes. Our physicians can help treat the fungus that causes Athlete's foot. What starts as minor discomfort can sometimes develop into a significantly worse condition that may even require surgery. From the moment you arrive at one of our locations in Browns Mills, Forked River, Toms River, or Whiting, NJ, a dedicated member of our team will work with you to go over your specific concerns. We'll quickly begin with an individualized treatment plan that addresses your specific needs. You can expect us to place your health above all else. The next time you are in need of treatment for one of these common foot problems, turn to the doctors at Ocean County Foot & Ankle Surgical Associates, P.C. Our range of services are designed to address many kinds of foot and ankle conditions. We are proud to serve residents throughout Ocean County, NJ and beyond. Call today to request more information or to schedule an appointment at one of our many locations.